"This award is a testament to the dedication of our workforce, and marks an exciting end to a very successful year for our company," said Joel Ross, CEO of Universal Electric Corporation. Universal Electric Corporation (UEC), a recognized leader in customizable power distribution systems, has won the Manufacturer of the Year Award in its category. The 2014 Manufacturer of the Year Awards are held by the Pittsburgh Business Times to honor the Pittsburgh region’s proud manufacturing tradition and promising future. UEC has been manufacturing innovative electrical power solutions for more than 85 years. Beginning with the U-S Safety Trolley system in the 1960s, UEC has continued pursuing cutting-edge ways to solve problems ever since. Today, in addition to the trolley system the company offers the STARLINE Track Busway and Plug-in Raceway products that offer simple, flexible ways to provide power to electrical loads, and STARLINE DC Solutions that provides a revolutionary 380V direct current as an alternative to alternating current for powering data centers. In 2014 UEC introduced the STARLINE Critical Power Monitor (CPM) to meet the growing need to capture, track, and display energy usage information. With the success of its various product lines the company has been able to increase both company and operating size, and it plans to continue this tradition of turning innovative ideas into state-of-the-art products. 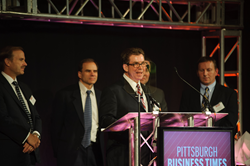 2014 marks the eleventh annual Manufacturer of the Year Awards program held by the Pittsburgh Business Times. In addition to this honor, in October of this year UEC was presented with the Tech 50 Award for Advanced Manufacturer of the Year by the Pittsburgh Technology Council. Universal Electric Corporation (UEC), a pioneer in electrical power distribution since 1924, is a world leader in the development of customizable power distribution systems. Industry innovators for more than 85 years, the company’s premium, flexible products are designed to fit the electrical power needs of any business in any industry. One of the only companies dedicated exclusively to flexible power distribution products, Universal Electric’s award-winning STARLINE and U-S Safety Trolley products have revolutionized electrical power distribution in data centers, industrial manufacturing facilities, retail chains and grocery stores worldwide. For more information, visit: http://www.uecorp.com.